Updated Sept. 10, 2018. Full map below. 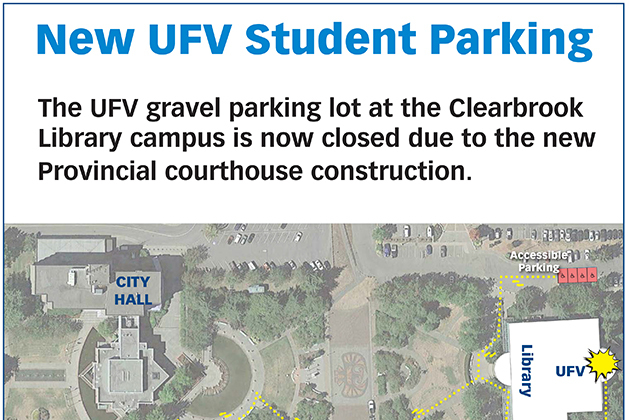 Permanent parking changes are coming to UFV’s Clearbrook Centre beginning Wednesday, July 4, as the City of Abbotsford begins construction on a new courthouse facility. 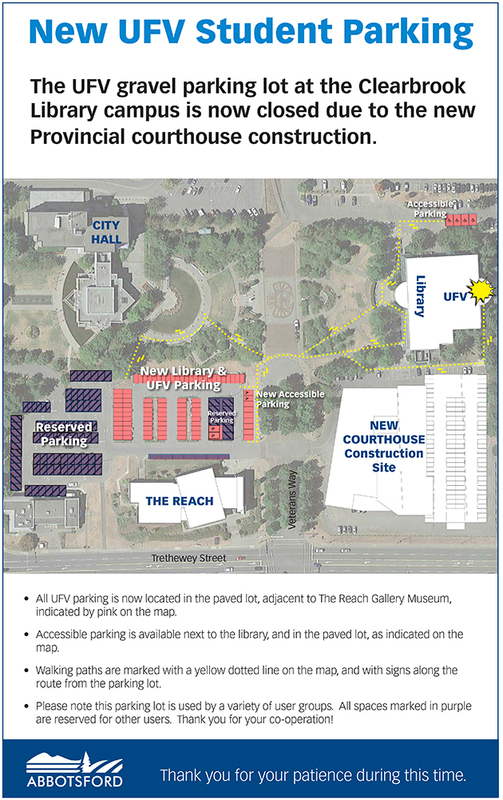 Parking for UFV’s Clearbrook Centre is being moved across Veteran’s Way, west of The Reach art gallery (see map, below). Courthouse construction is expected to take two years. Access to the Clearbrook centre will be safely maintained throughout construction. Parking on the new UFV Clearbrook lot will continue to be free of charge. Disability parking is being provided in front of The Reach. The new UFV parking area includes 80 parking spots, fewer than the previous location allowed. 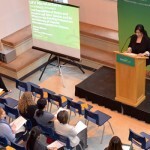 Consequently, students, staff, and faculty are encouraged to consider space-saving transportation options, including car-pooling and public transportation. 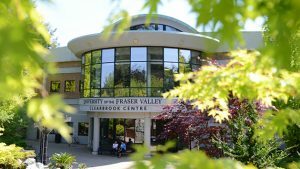 The property previously used for UFV Clearbrook parking will be replaced by a $150-million, 14-room courthouse that includes three Supreme Court law courts, eight provincial court courtrooms and three judicial conference rooms.